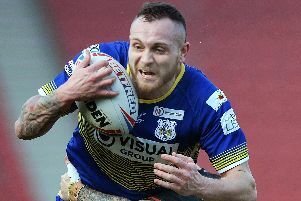 Doncaster RLFC will lack three of the side which posted their biggest win of the season in their final League One game of the regular season. Skipper Kyle Kesik, full-back Tom Carr and stand-off Jordan Howden will all miss the trip to second-placed Rochdale tomorrow and join the likes of forwards Matt Nicholson, Brad Foster and Mike Kelly on the sidelines. “Kyle’s hamstring is sore and Tom suffered a dead leg while Jordan suffered a recurrence of the hip problem which saw him miss the start of the season,” said head coach Gary Thornton. “It’s not ideal being without three key players against a strong Rochdale side but hopefully all three will be fit for the first play-off match in a fortnight’s time. “Ryan Wright will come in for Kyle and winger Louis Sheriff, who we rested last week, will play either full-back or stand-off. Victory over Hemel Stags secured the Dons a top-four spot which ensured that four of their seven play-off games will be at home. But defeat at Spotland, where Rochdale have dropped just one point, would see the second-placed Lancashire club open up a five-point gap on the Dons.